Small grilled onigiri (soy sauce). Imbued with the umami of both kombu seaweed and bonito. Made using specially cultivated Koshihikari-variety rice from Niigata Prefecture. 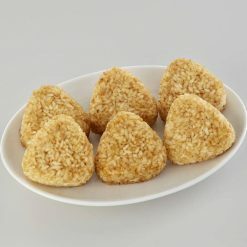 Each package is 300g, contains 6 onigiri total, and arrives frozen. 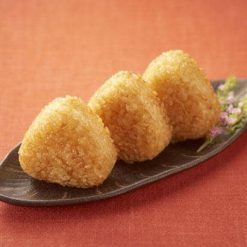 Onigiri, or rice balls, are one of the most popular snack foods in Japan; and are sold at train stations, convenience stores, and supermarkets all over the country. These mini soy sauce-flavored grilled onigiri have been infused with the umami of kombu seaweed and bonito. The onigiri were made using specially cultivated Koshihikari-variety rice from Niigata Prefecture. The umami of the rice has been drawn out through a process of cold room maturation (a technique where, in order to draw out the rice’s natural umami, the rice is placed in a storehouse where the temperature can be completely controlled, then cooled to -2℃ (below freezing) and allowed to mature in the cold for a designated length of time. In addition, the water content of the rice does not go down while in the cold room, and its ability to retain water goes up; an ideal attribute for frozen onigiri). Due to changes involving the location where this item is produced, ingredient ratio and other things will differ from the current product. Leaving space between them, line up the grilled onigiri (still frozen) on the edges of as large a plate as possible, and microwave uncovered approximately as follows. In a 500W microwave, cook one onigiri for 1 minute 20 seconds, two onigiri for 2 minutes, four onigiri for 3 minutes 10 seconds, and six onigiri for 5 minutes. In a 600W microwave, cook one onigiri for 1 minute 10 seconds, two onigiri for 1 minute 40 seconds, four onigiri for 2 minutes 40 seconds, and six onigiri for 4 minutes 30 seconds. Cooking times will vary depending on the model and output power of your microwave. Please adjust accordingly. Will be very hot after microwaving. Please use caution to avoid burns. If additional cooking is needed, continue to microwave in increments of 5 to 10 seconds. This product contains polished rice (Niigata Prefecture), soy sauce (contains wheat), katsuobushi extract, kombu seaweed extract, sugar, table salt, vegetable fats and oils (soybean oil, rapeseed oil).. Origin of ingredients: rice (domestic). Prepared and packaged in Japan.